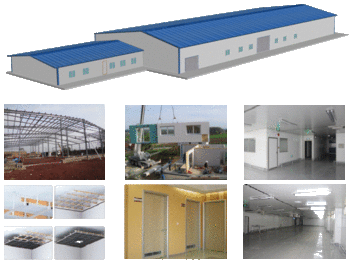 General description: we provide a designing and building constructions for factories, workshops, offices, cold rooms, storehouses, etc. They can be build by using of strong steel framework, prefab "sandwich" panels and PVC doors/windows. Our construction projects provides all systems for electricity, power supply, lightings, heating systems, air conditioning systems, security video-surveillance, tap-water (cold & hot), sewages, sanitary rooms (WC, showers, changing rooms), workshops, warehouses, cold-rooms, offices, guest-apartments, etc.